Recently on The PEAK TV, coordinating producer Emily Paulin rode a horse for the very first time. This segment was part of her series, “Emily Tries New Things,” and aired on Channel 69, Sunday night, January 8. Emily’s first ride was on the retired world champion Morgan gelding, Hermitage Avatar GCH, who is stabled at Alicia’s. ‘Ronnie’ is now 22 years old, and a key member of Alicia’s lesson program. But when Emily first stood alongside Ronnie, she thought he was really big. “Once I got on Ronnie, Alicia talked me through all my fears and concerns,” Emily said. “She made me feel ten times better than when I first got on. Emily can’t wait for her second ride on a horse! Both she and Alicia said they had good feedback and response after this show aired, and hope it shows people that horseback riding can be both fun and good for you. 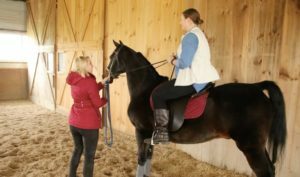 In a new location, Alicia is thrilled with the support she received from the local horse community and with the inquires about her lesson program at Scottfield Stables.